What do you get when you combine deep-blue Norwegian fjord waters, towering cliffs, powerful waterfalls and one of Europe’s greatest rail journeys? You get Fläm and Aurlandsfjorden – a world-class scenic destination. As the Crown Princess pulled into the docks of the pretty small town of Flåm this morning, I ate breakfast around 8 a.m. The small village in Sogn og Fjordane county is located at the inner end of the 18-mile-long Aurlandsfjorden, itself a branch of the larger Sognefjorden. In fact, the 122-mile-long Sognefjorden is Norway’s longest fjord and reaches the astonishing depth of 4,300 feet deep! 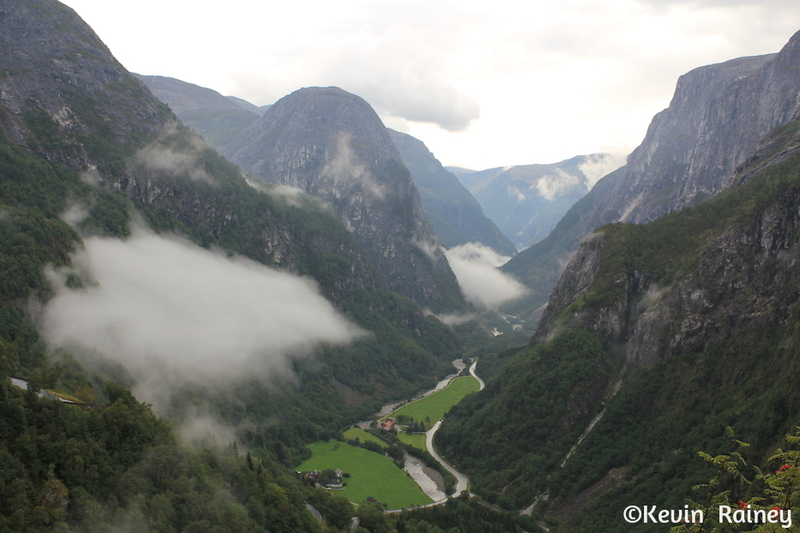 All the while the fjord is surrounded by steep mountains reaching as high as 5,900 feet. It is an absolutely stunning landscape that was tortured by glaciers several millenniums ago. 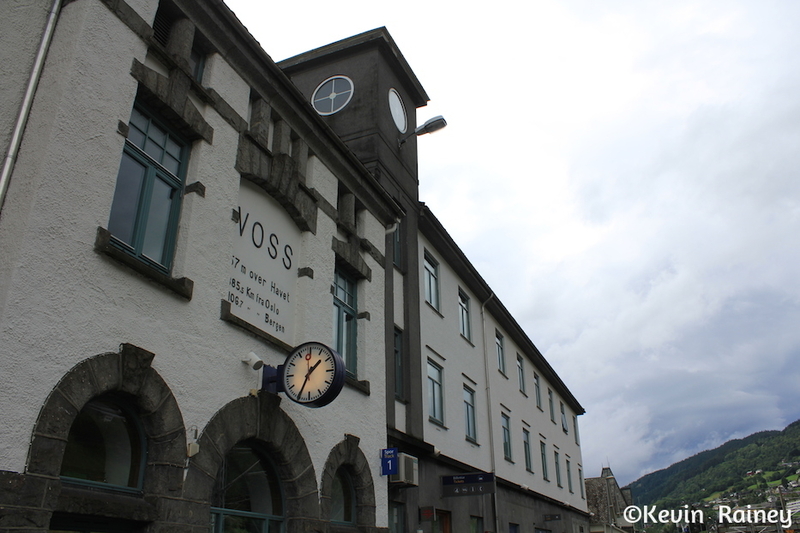 Around 9 a.m., we boarded a coach through fjord country to the resort town of Voss. 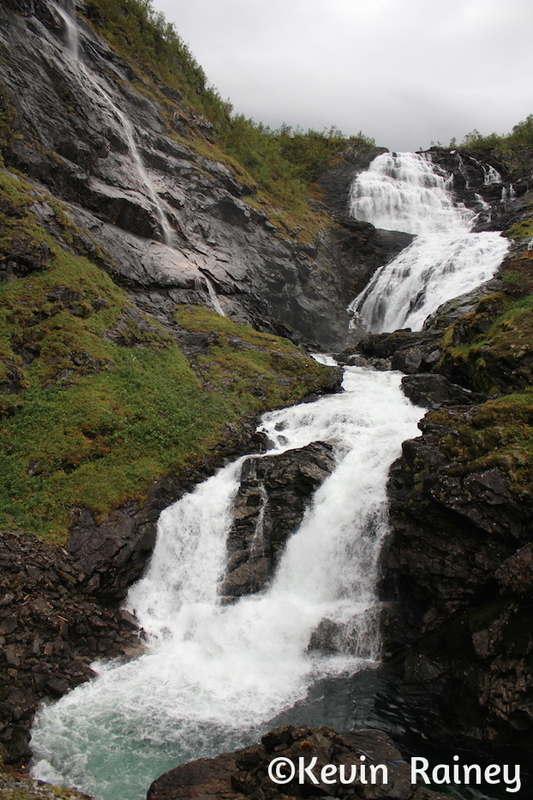 Leaving Fläm, I became hypnotized by the scenery of snowcapped mountains, isolated homesteads and beautiful waterfalls. We drove through one of Norway’s longest traffic tunnels to Gudvagen, located at the end of the Nærøyfjorden. 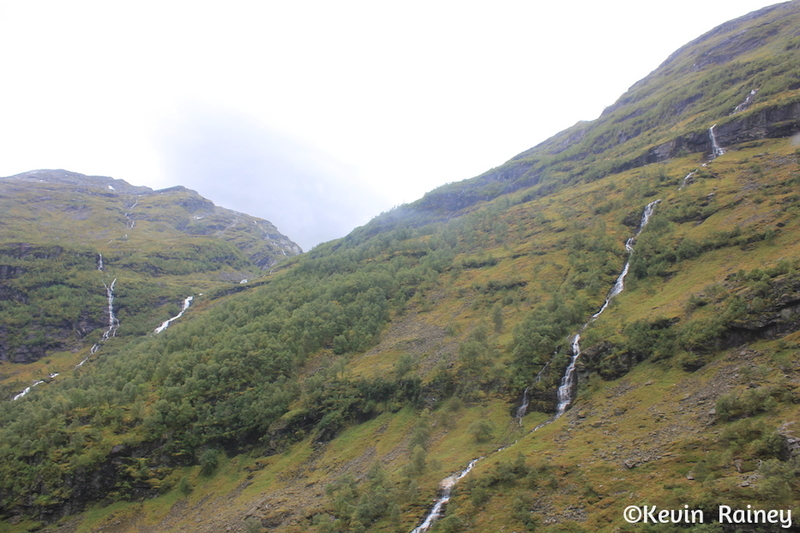 From there, we drove up the Nærøy Valley, passing several picturesque villages along the way. Then we climbed Norway’s steepest road and traveled past the breathtaking Oppheim Lake en route to Voss. Along the way we stopped at the famous Stalheim Hotel for hot chocolate and pastries. After the snack, I went out on the patio overlook of the Nærøy Valley. The view unfortunately was obscured as storm clouds hung over the valley. For a few moments, I thought we would miss the famous view that traveling artists, painters and poets have been coming to see for the last 200 years. Suddenly, shifting winds began to lift the clouds away the valley in front of my very eyes. It made the valley below look even more dramatic and picture perfect as God’s work of art revealed itself between the two mountains. 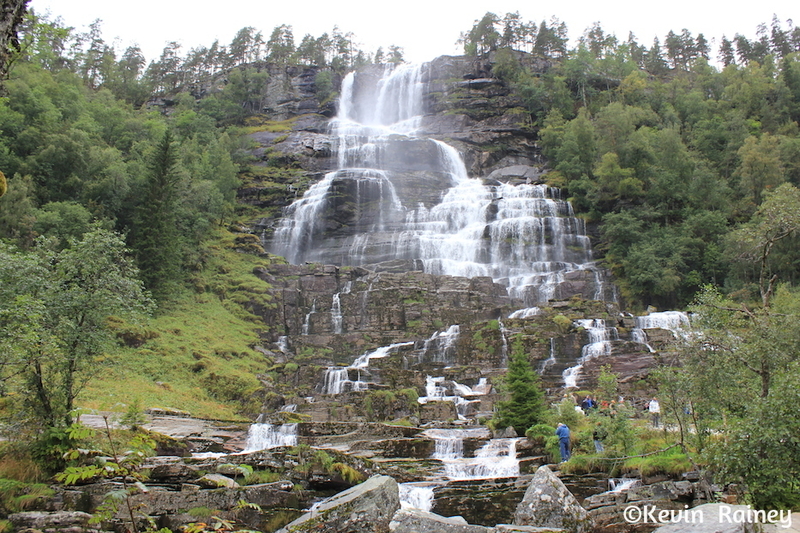 After leaving the Stalheim, we stopped later at the Tvinde waterfall. This beautiful wide waterfall is a must-see as it cascades above gentle farmlands below. Then it was on to Voss. Voss, located in Hordaland county, is an ancient Norwegian town overlooking a beautiful lake and surrounded by beautiful mountains. The town is known worldwide as a top ski destination and hosts international World Cup ski events. The town has a number of shops and cafes, but we had a lunch buffet smorgasbord of salmon, meats, fresh vegetables and pastries at Fleischer’s Hotel restaurant. I had ørret (mountain trout), cured herring, rumgraut (a sour-cream porridge covered with melted butter, brown sugar, and cinnamon) and flatbrød (paper-thin crisp rye bread). The food was outstanding at this restaurant located in the same building as the historic Voss train station. We had a little time afterwards to explore town. I decided to visit the Vangskyrkja (Old Church) down the street. 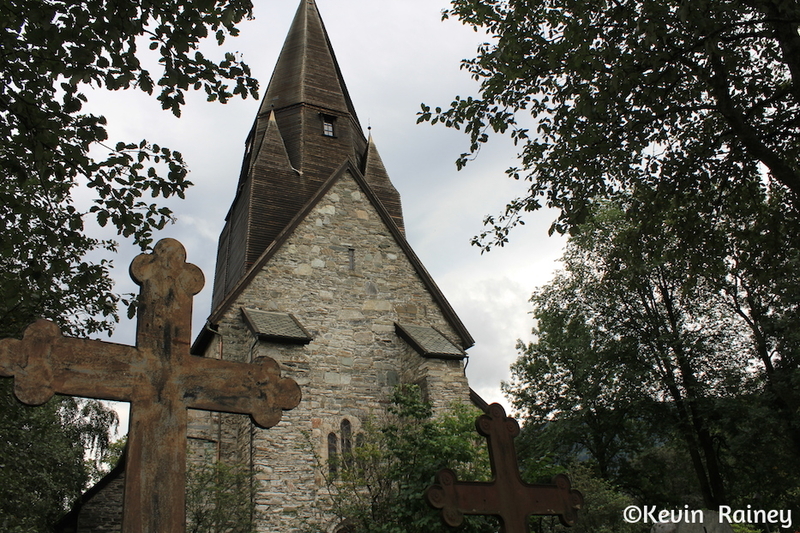 The stone church was built in 1277 and it’s a marvelous historical structure. It withstood Nazi bombings and occupation by the German Wehrmacht after Voss put up strong resistance during World War Two. Back at the train station, we later we boarded an NSB (Norwegian National) train east towards Oslo. 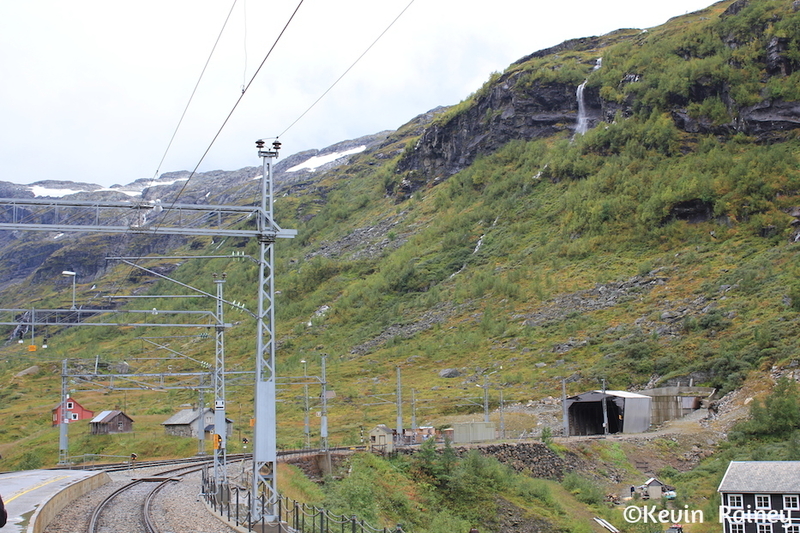 We exited the train at the small mountain pass stop of Myrdal. 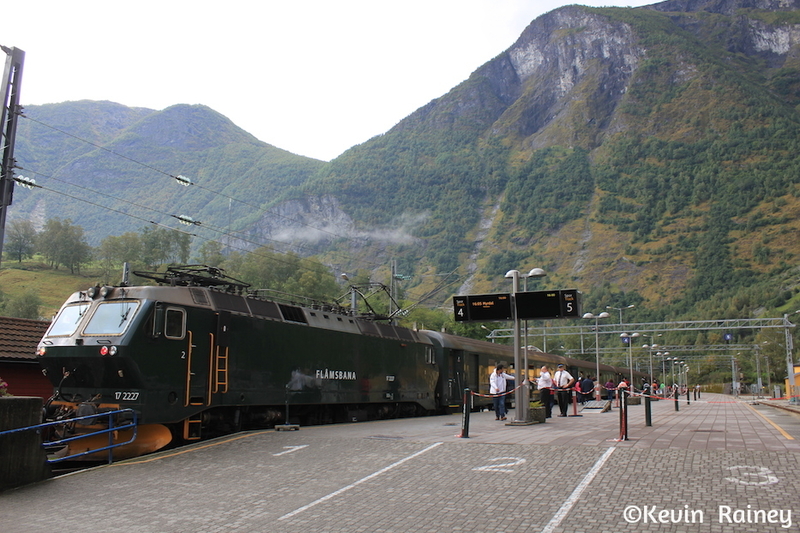 From there we waited on the Flåmsbanen – one of Europe’s most famous and beautiful rail journeys. I had taken this journey before in the wintertime when everything – including the waterfalls – was frozen. Today was much more pleasant. I couldn’t believe how green and lush it was in the late summer. When the narrow-gauge Flåmsbanen arrived, we jockeyed for the best seats on board. You want to sit on the left as the train descends to Flåm for the best views. This is one of the world’s steepest railway lines as it descends 3,000 feet to the fjord below over a short 12-mile journey. The views include thundering waterfalls and majestic mountains ruling over the placid valley below. Along the way we stopped for five minutes and were allowed to get off at the 280-foot Kjosfossen Waterfall. As we exited, a classical music show began and a blonde maiden appeared dancing around the falls. She would disappear briefly before “magically” reappearing at other viewpoints around the fall. It was highly entertaining and quite a sight too behold. 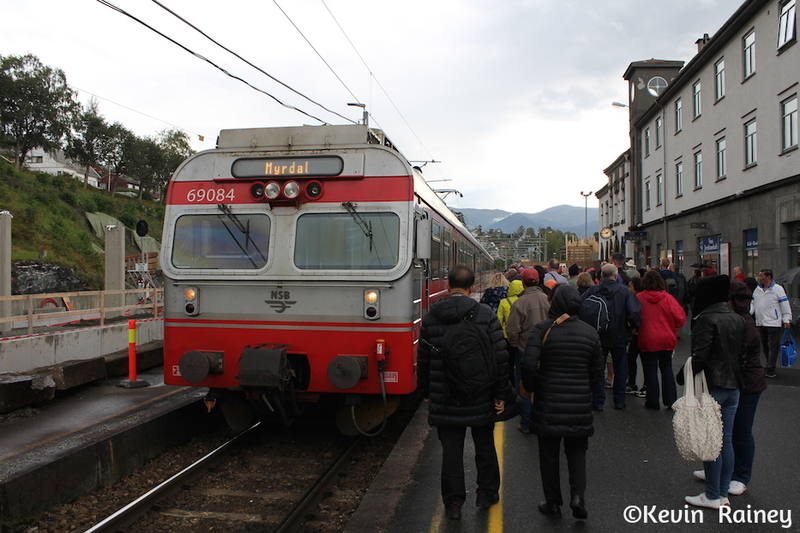 When the show was over, the train blew its whistle and we boarded for the final leg down to the Fläm Valley. 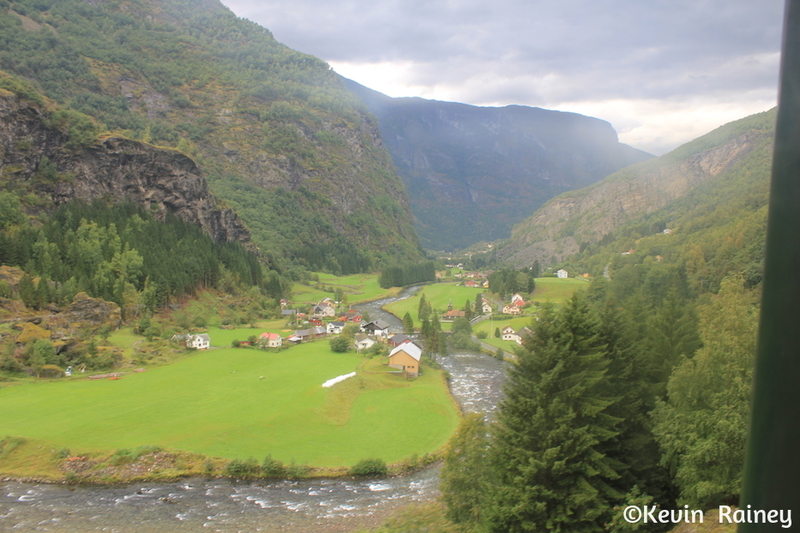 Our train hugged the cliffs and plunged through tunnels as we approached Flåm. 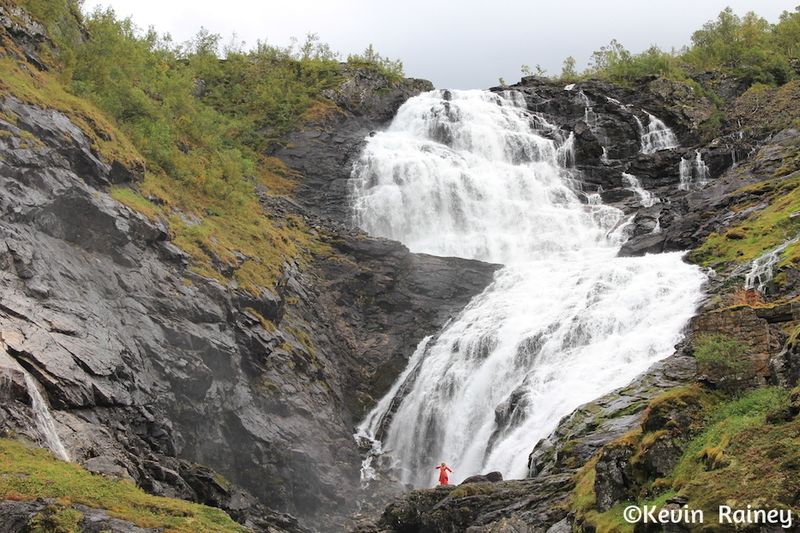 Can you see the maiden dancing in front of the Kjosfossen? After we arrived back in Fläm around 16:00 p.m., we had time to explore the town. We briefly explored the railroad museum, which tells the story of how this incredible work of railroad engineering came to be. Then it was time to head back to the Crown Princess. Back on board the ship, I went to the hot tub on the top deck. This was certainly a hot tub with a view as we departed Fläm around 18:00. I admired the Aurlandsfjorden – called Norway’s Grand Canyon – as we departed. Later I met up with Mom, Dad and my brother for dinner to celebrate with a fine meal in the plush Crown Grill restaurant. I had an amazing filet mignon and lobster bisque soup. The view outside were gorgeous as the sun set down the Aurlandsfjorden. That evening after going to the gym, I went back to the room and relaxed. I couldn’t have asked for a more beautiful day in Norway at a truly world-class destination. Tonight it’s on to Stavanger.